When I began playing disc golf more than 20 years ago, all discs were basically the same in terms of material. They were all plastic, and they were pretty much all the type of plastic we now refer to as DX (Innova’s term) or Pro-D (Discraft’s). Yet despite the fact that the market for golf discs is now inundated with a continual flood of new models – most available in at least three grades of plastic – one thing has remained constant: They’ve always been made from plastic. Until now. A couple years ago, yet another company decided to vie for a share of the steadily-growing golf disc market, and it’s decision is significant for two reasons. First, the company is Vibram, whose founder is credited with inventing the first rubber soles for shoes. Their numerous products are manufactured in Brazil, China, Italy and here in the U.S. More than 1,000 footwear makers use Vibram’s rubber soles in their products. You’ve most likely seen their ubiquitous little octagonal yellow logo on the bottom of hiking and work boots. The fact that Vibram is all about rubber is the second part of the significance of their entry into the disc golf market, and the reason I wanted to write this review (yeah, I’m getting to the actual disc review). Although there are more golf disc brands out there than ever, Discraft and Innova still have an iron-fisted grip on the market. 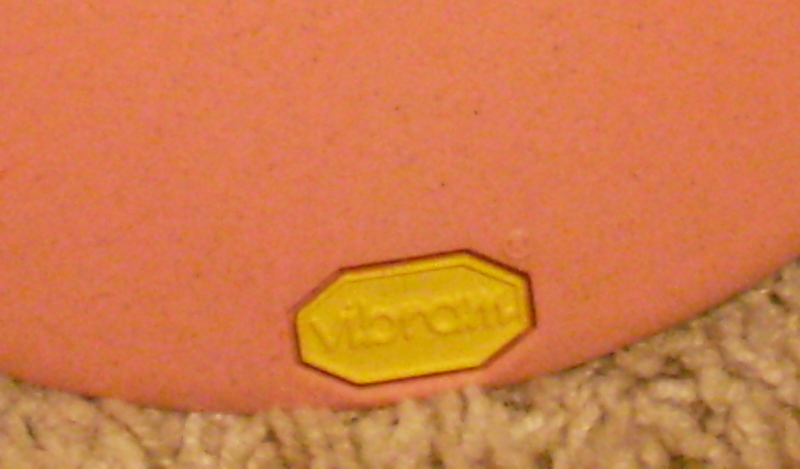 Ironically, if Vibram is successful it will be largely because of grip. You see, their discs are made of rubber (or as they put it, a rubber compound) and they claim that rubber makes for a better grip, and a more durable disc with flight characteristics that change much less than all plastic discs over the life of the disc. If they are right, and if those two factors end up affecting the purchase decisions of the average disc golfer, we may see a future where the answer to the question ‘What kind of plastic are you throwing” is “none- I’m throwing rubber.” But the proof is in the putting (and the drive, and the upshot), so let’s get to the review. All their putters are available in three ‘firmnesses’ of their X-Link rubber compound– soft, regular, and firm. I appreciate the straightforwardness of these labels, as opposed to a certain coffee franchise that insists on calling a large a ‘Venti’. But I digress. The soft is extremely soft. Other adjectives come to mind, like floppy, bendy, and even sticky. But curiously this pliability doesn’t affect the stability. The regular firmness is much more like a regular plastic disc to the touch, but still noticeably grippier, and their Firm blend is still as grippy as, or more so than, an old-school, low grade plastic golf disc. I didn’t get to test the same disc model in different grades of rubber, so I can’t comment on how the flight characteristics vary in the same model when the firmness is different. But as you’ll read in my review of the VP, I doubt it varies much. After a month of play on several Santa Cruz, CA area courses (plenty of rough terrain, including rocks, trees, roots and dirt), all four discs have held up very well. None of my sample putters suffered any nicks or cuts to the rim, and the sharper-edged Ascent driver only has a minor nick on the inside rim. To me that’s especially notable since with plastic, the softer or grippier the disc the more likely it’ll show wear and tear. According to Steve Dodge of Vibram Disc Golf, they plan to release a couple mid-range discs in 2011, which I am particularly eager to test. To me superior grip is especially important when the shot requires pinpoint accuracy. Coming soon, (after I’ve had a chance to play with the Vibram discs for awhile and test Vibram’s claim of superior durability) the individual disc reviews of the Vibram VP, Ridge, Summit, and Ascent!